Value propositions – officially defined as “an innovation, service, or feature intended to make a company or product attractive to customers” -- are critical to the health and growth of your business. Precisely how critical you consider them in this regard is a function of personal experience. Mark Coronna shares a best practices discussion with practical guidance on building a compelling value proposition. 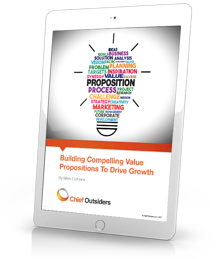 The chapters in this eBook will offer deep dives on different aspects of value propositions, and provide you with proven do’s and don’ts.